SmartSpreadsheet is an extension for Qlik which can extend the visualization capabilities of Qlik applications by simply using a spreadsheet look and feel. The power of Qlik meets the limitless possibilities of the spreadsheet and users discover a whole new world of Business Intelligence. Common popular spreadsheet features such as formula engine, sorting, filtering, input controls, sparklines, and native input/output can now be combined with the associative logic and interactive interface of Qlik. With rich formatting capabilities of Smartspreadsheet, you can change text color, cell background, set text align, rename column headings, etc. Or you can upload your excel theme and enrich it further. Once resized, columns will preserve their state even if you leave the page and visit it later. The server-side impementation ensures accurate and precise mathematical calculations, which can be applied to a cell or group of cells. It supports absolute references in formulas (e.g. $A$1). The innovative feature of SmartSpreadsheet is its library of mathematical functions that are supported. It allows the user to perform different mathematical operations on cell contents based on Excel-like functions but blended with Qlikview’s including Set-Analysis! Adding SmartSpreadsheet on a Qlikview application can't be easier. Its functionality is built on the technology of Qlikview extensions. It comes as QlikView Archive File (Qar) that helps you install easily and bind it with your loaded data. When the extension is configured, all you need is to add it in the tab that you want. You get a nice-looking table view to organize and analyze your data. You can fill in and edit your grid online right in the browser. While you enjoy the desktop-like user experience, SmartSpreadsheet saves all your changes to the server side and updates the database on the fly. SmartSpreadsheet has built-in export to PDF and Excel feature, so you can quickly keep your work into necessary format for future reference. Instead of sending raw data from your Qlikview application to Excel and do the analysis there, now you can do all the work on the web-interface through Qlikview Server and SmartSpreadsheet, share your work with others and only when finished send it to Excel. At the same time you take all the advantages of Qlikview. Thus, using Qlikview built-in ETL features, data from source systems are modeled, transformed, and loaded into memory. The resulting set of data, in memory, is the source of data for the front-end objects. Qlikview’s associative architecture maintains the relationships among all data points in memory, in real time. After each selection that a user makes, the associations in the data model are updated. That means the front-end objects do no not require SQL-like queries to define the object. With minimal training, non-technical users can create their own dashboard objects without knowing how to write SQL queries. Perhaps the most effective driver of data discovery in Qlikview is its patented associative query logic. Associative logic is the ability to visually see how other pieces of data are interlined with your selections. The feature that truly differentiates Qlikview is the ability to see also the data that is not associated. The power to show you what is related and what is not related is a key feature of Qlikview patented associative logic. A user accustomed to the traditional BI report interface knows that they need a plan before actually seeing any data. Typically, the user must select a specific report and provide the required parameters or filters before the report is run. Qlikview completely rejects this approach, and instead presents the user with all of the available data, immediately accessible in the interface. When a user access a Qlikview application, data is visible right away, without specifying any parameters. The user interacts with the interface to step through the data in an exploratory way, to zero in on specific results. With an attractive and interactive interface, Qlik apps encourage users to ask questions of the data, which can encourage asking questions of each other, resulting in collaboration, which can then lead to true business insight. 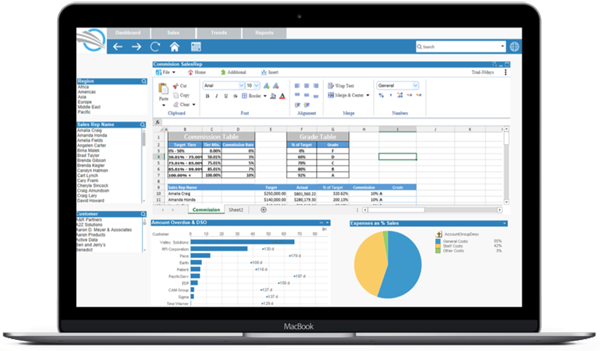 Combining it with the really innovative SmartSpreasheet extension and you will have return on investment in no time! Contact us today.